Tis the season for holiday baking! 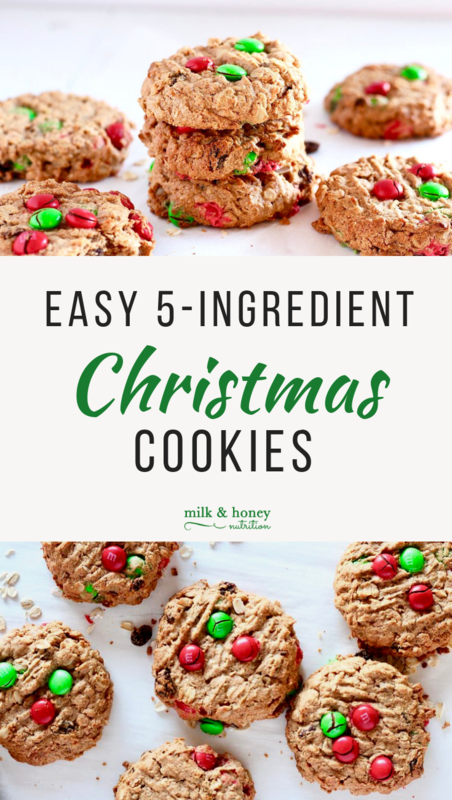 These Easy 5 Ingredient Christmas Cookies are a perfect way to whip up a quick treat and easy enough you can get the kids involved too. Just throw all the ingredients in a bowl, mix it up, and you’re done. This recipe for Easy 5 Ingredient Christmas Cookies was sponsored by Bob's Red Mill. All ideas and thoughts are my own. Preheat your oven to 350 degrees. Line a baking sheet with parchment paper. Using a whisk, mix the peanut butter, maple syrup, and egg together in a bowl. Add in the oats and your mix-ins, and mix until combined. Chill the dough for 10-15 minutes. Use either a cookie scoop or an ice cream scoop, depending on what size cookies you would like, to scoop the dough onto the parchment lined pan. Using a fork, gently flatten the dough balls into your desired shape (the cookies will not change shape much while baked). Bake for 10-12 minutes for smaller cookies and 15-17 minutes for larger cookies. Remove the cookies form the oven and let them cool for 5 minutes before transferring to a wire rack. Enjoy!